Imagine relaxing in a very clean, comfortable home with breathtaking views, where you can get away and relax all year round! Our home is located inside the Big Boulder Resort, so skiing and snow tubing are here to enjoy in the winter, and the 175 acre lake and man made beach are here to enjoy in summer! Our home features 5 bedrooms & 3.5 baths and is located inside Big Boulder Resort in Lake Harmony PA. There is plenty of room for everyone to spread out and relax! The layout of our 5 bedroom townhome is ideal to allow plenty of space for your entire family to take a vacation without feeling like you are invading each others space. So much to do right here: Winter - skiing, snowboarding, snow tubing; Summer - lake & beach! Big Boulder Mountain has all levels of trails including black diamonds runs, and snow tubing! Within 10-20 minutes a ton more to do - golf at many courses including the Jack Frost National 5 star golf course with rolling greens and breath taking views, Casinos, hiking biking, shopping, tree tops courses, whitewater rafting & more! It's all waiting for you to enjoy NOW! Family owned home, very clean and comforable with newer furniture and appliances. Bedrooms are split up by floor to try to keep families together. Main floor has master and full bath, top floor has 2 bedrooms, one with 2 sets of bunks (4 twins), and one w/queen as well as a full bath. 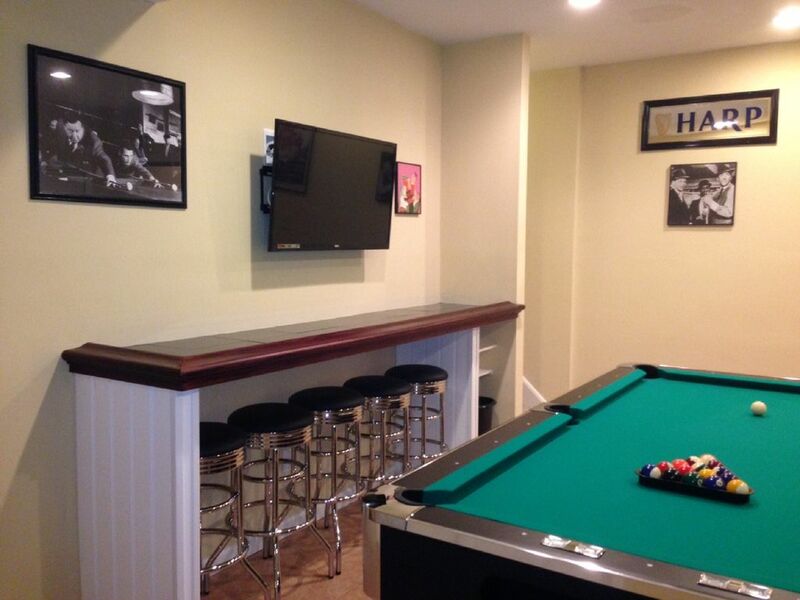 Lower level has has 2 bedrooms, two twins, one queen, and another full bath, as well as game room and bar area! Every room has TV, except bunk bed room! This way, parents can sleep nearby to their kids and practically have their own floor! (please bring your own towels & toiletry items. linen services are available nearby). We include all Bed Linens (sheets, blankets & pillows)! Big Boulder Ski mountain located within our complex, we have amazing views of the mountain from our home! Spectacular views of Big Boulder Mountain! LINENS PROVIDED! YOU ONLY SUPPLY YOUR TOWELS & TOILETRIES! Two designated spaces in front of our home. Overflow lot available behind tennis courts for additional vehicles. With gas fireplace, flat screen tv, and beautiful slope views. Stainless steal, freezer on bottom! There will be initial supply of paper towels and toilet paper - you should bring additional rolls. Fully stocked, including dish detergent; towels & sponges; spices & oil! Flat screen TV's in every room, except bunk bed room. Selection of DVDs to choose from. Lots of games provided for Game Cube all rated Everyone. Boat rentals available at Lake Club. Complete w/table & chairs & umbrella! Skiing and snowboarding available at Big Boulder Mountain & Jack Frost Mountain, as well as other nearby mountains. A lot of nearby golf courses, including Jack Frost National! Daily passes available for purchase at Mountain Lake club. Large pool located next to lake & beach, along with boat rentals and more. -BED LINENS INCLUDED (SHEETS, BLANKETS & PILLOWS). YOU -BRING YOUR OWN TOWELS & TOILETRIES - -THERE IS NO ADDITIONAL CLEANING FEE. Three floors of fun, and great mountain views! 7 Flat Screen TVs Gameroom with pool table/ping pong and surround sound. Beautiful home with mountain views!! My family had such a wonderful long weekend at this beautiful mountain house. Location, location, location!! Couldn't have been more perfect. The kids could have actually walked to Big Boulder. If we had binoculars we could probably have spotted them on the slopes! Just a few minutes to all our favorite restaurants. Very clean, comfortable and relaxing. Hoping to come again next year!! We stayed 10 people together and it was very good and spacious and have all equipment to cook. Only thing that I want to request to put some curtain in the living room. Thanks. So happy you enjoyed your stay in our home! We just installed a new blind on the living room door this past weekend! We used to live in Philly and used to come back every October. We have rented in Laurelwoods for years. Our daughter was very ill and we could not come for several years. This past October was the first return trip. This property was so very clean and ready for us. We felt at home. Our hopes are that we can return year after year. We are only 2 retired people but have an overnight guest here and there. We do not need the space but love the place!!! We hope the owners will have us again . . . . You cannot go wrong with this property. The place was perfect for us! A beautiful place! The house was beautiful! Plenty of room! Clean! Great location! The lake was great and the food at boulder tavern was delicious! Plenty to do! We had a great time! Would definitel rent again! The area was perfect, drove from Western NY so the drive wasn't bad. The town home was so clean, rooms very good size, had everything we needed. Just down the road was the Boulder Lake Beach Club. A week pass was $50 for 6, very reasonable for a nice beach, heated pool, and wading pool, staff very friendly. There are no motor boats on the lake so it's very quiet. We rented a pontoon boat for 2 hrs and had a wonderful time. My 3 yo and 20 month old grand children enjoyed themselves so much. There are many hiking trails in the area and bringing bikes would have been great. I recommend this home for vaca. Lake Club passes can be purchased at the Boulder Lake Club if you are renting our home. The charge is $50 for a weekend or $75 for a week, for 6 passes. This gives you access to the beach, pools. boat rentals and more! We are also conveniently located less than 5 minutes away from the indoor WATERPARK at Split Rock & Jack Frost National Golf Course. We are located just 15 minutes from Camelback & Kalahari Resort!